A Taiwanese Christian pastor was detained for singing the worship song "Jesus Love You" in Zhengzhou, Henan, in China, which officials there have branded as an "illegal religious activity." ChinaAid, which reports on persecution and human rights abuses in the world's most populous nation, said Pastor Xu Rongzhang from Taiwan was detained on Saturday, the day before Easter, because he led a group of Christians in Zhengzhou to sing the song. Xu was released later on the same day, though his identification documents and permit to travel to mainland China were not returned until Monday. Local officials never explained why singing "Jesus Loves You" is now deemed to be an illegal activity, though several Christians across China in recent months have been arrested and even sentenced to prison for participating in religious activities. Five Christians, including a pastor, were sentenced back in February by a court in the northeastern Liaoning province to between three to seven years in prison for purchasing and selling what authorities called "forbidden Christian devotional books." "Most of them belong to a Korean ethnic minority group that resides within China, and all of them attend registered churches. They were arrested last June," ChinaAid said at the time. The persecution watchdog group also reported in January that a Christian woman was arreseted by police along with four other believers for holding a Bible study without government approval and were subsequently sentenced to three years in prison. Ma Huichao was reportedly convicted of "gathering a crowd to disturb public order," a charge that is often lobbed at underground Christians in China. The Communist Party has been engaging in a wide-spread crackdown on Christianity over the years, with ChinaAid reporting that authorities are concerned about the rise of the Christian population. In March, Freedom House warned that at least 100 million people, including Protestant Christians, are facing "high" or "very high" levels of persecution at the hands of Chinese officials. "A Taoist disciple joins the order without knowing when he will be admitted to priesthood. Dozens of Christians are barred from celebrating Christmas together. Tibetan monks are forced to learn reinterpretations of Buddhist doctrine during a 'patriotic reeducation' session," the Freedom House report said of the various religious freedom abuses taking place in China. 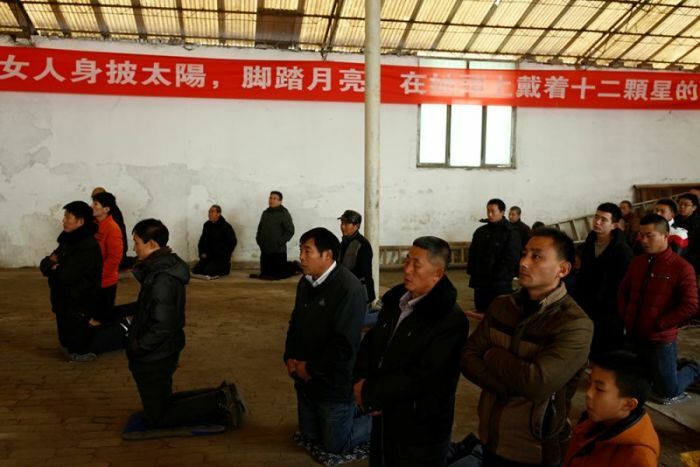 "A Uighur Muslim farmer is sentenced to nine years in prison for praying in a field. And a 45-year-old father in northeastern China dies in custody days after being detained for practicing Falun Gong," it added. The report also accused President Xi Jinping of intensifying persecution and restrictions on religious believers since taking the helm of the Communist Party in 2012, though noted that believers have responded "with a surprising degree of resistance" to the challenges.